*Disclaimer: I am a certified and practicing teacher of 5+ years of ages preK - adult with 2 years of teaching and lecturing about quilting under my belt, but I do not consider myself a teaching expert. Far from it; I'm always learning and updating my classes and approach (really, all of us teachers do this!). 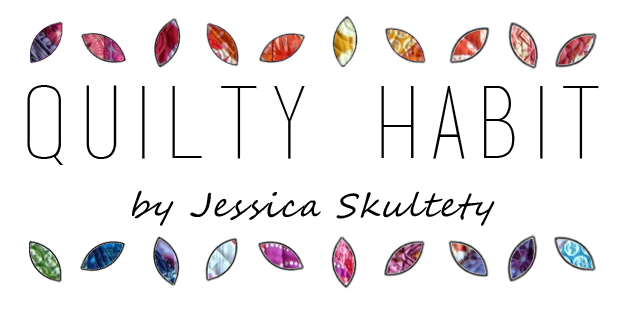 These are merely reflections based on my experiences as an in-person quilting teacher, because there seems to be a shroud of mystery around what it takes to teach a quilting class (I thought I'd shed some light). 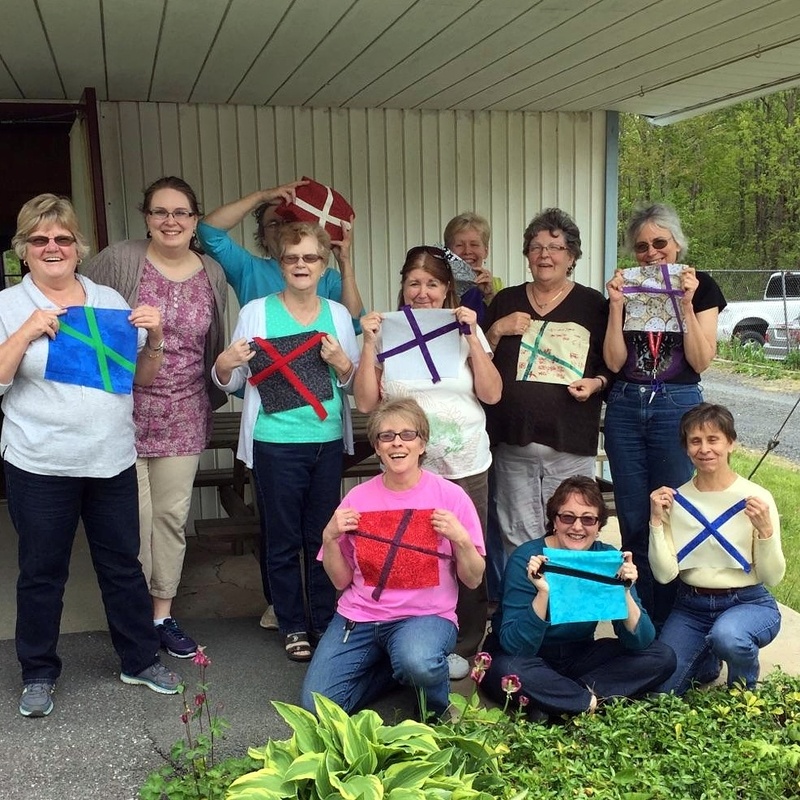 Have you ever thought you might want to teach sewing or quilting to adults? That's great! Quite honestly, it's a lot like teaching a regular class of kids. Especially because the adults are learning something brand new. And there's always someone who forgot their pencil (or seam ripper). All joking aside, teaching a quilting class is something that should be taken under careful consideration. 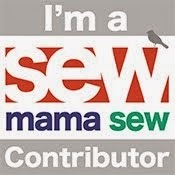 It is not as simple as instructing someone how to sew (if you can call that simple!). Take that energy you exert and multiply it times however many people are in your class (my classes typically cap at 20)! And then add in the exhilaration, voice projection, organization, and confidence. The absolute best part of teaching quilting classes is interacting with students. Whether it's working one-on-one with a quilter on the nitty-gritty of her color contrast for ten+ minutes, watching someone successfully free motion quilt for the first time, or breaking bread with guild members/shop owners before or afterwards, it's all absolutely amazing. I wouldn't trade those moments for anything. 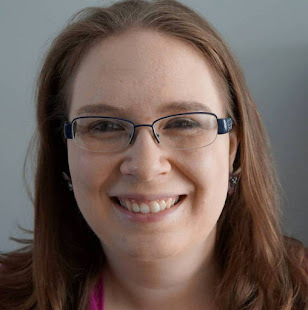 I love learning about all of the quilters out there and actually getting to know them IN PERSON, since a huge chunk of my quilty world (and, I would hazard a guess, yours) is online these days. At the forefront of my mind, I'm always thinking about how everyone joins the class with prior knowledge and different expectations. There have been times where I explain one way of practicing a technique, and another student will pipe up and explain another way. I love that, because we all benefit from it! That's what makes a great class to me: open communication between teacher an students, and teachable moments. I always try to embrace the unexpected, but it can be hard (I'm sure my background as an improvisation troupe member and actress helps). Guys, this was my VERY FIRST QUILTING CLASS back in 2014. Photo by Robin Buscemi. Which leads me to this: one of the most misunderstood parts of being a teacher is that it's all about you and your class plans. Nope, guess what... it's only about your students and what they walk away with. Think about how you would feel if you paid to take a quilting class, and you felt inferior or undervalued in some way (I bring this up only because I've heard horror stories before). Or maybe you didn't get to sew at all, and sewing was promised (and you spent the whole time cutting fabric)! My main goals are to make sure the class is consistent with how it was advertised, communicate effectively what I want students to walk away with, and to mix up instruction constantly (as in, you're not sitting there listening to me talk the whole time - this is not a lecture in the slightest). Earlier this month, I was thrilled to return to the Colonial Quilters Guild in Bethlehem, PA for a lecture and a double class. When I visited in April to give my "Modern Quilting: What's All The Hubbub?" lecture at their meeting and quilt show, they wanted to know more about my quilting. And I was luckily invited back to delve deep into the the fabulous world of domestic machine free motion with them. This was only the second time I had formally taught free motion quilting to a group. I came up with my class structure and planned out all of our exercises in advance. If you've been trained as a teacher of children, you'll already know the degree of prep work that goes into creating a successful class. I'm definitely not saying you have to have an education degree to teach quilting classes, but it definitely helps me all. the. time. My first free motion class, the beginner level, filled fast, and there were people on the waiting list. I was pleased and also shocked. Then, I realized that teaching 20 people to free motion for the very first time was a tall order for anyone. I want to be able to give enough individualized attention to each student - and each student comes with their own prior knowledge, expectations, and skill. Therefore, I made the executive decision to cap that particular class at 15 students in the future. In fact, it's even in my contract now! I'm not afraid to change my classes up based on what works and what doesn't. The class I taught with 20 students worked well from my perspective, but I'm still going forward with the new contract stipulation. My point in explaining all of this is simply that teaching quilting classes is my favorite thing in the world, but it's also completely exhausting. Usually I need 1-2 days of recovery after a 6 hour gig! Then, I'm raring to sew on my own, because my eyes have been opened to so many ideas by students. That being said, if you're available and interested, take a local class. 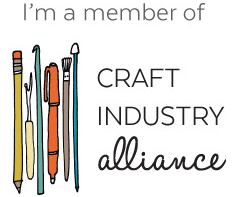 Support your quilt teachers and local quilt shops. It takes a lot of administrative work behind the scenes just to set up a class (like, tens of emails), and so much more for the teacher to prepare for it (for example, just setting up the classes section of my website took weeks, but it saves me time now, because guilds and groups can hopefully find most of my info in one place). When classes have to be cancelled due to low enrollment (and this happens more than you might know, for shops and guilds), everyone suffers. It's not just one of my gigs; it really is the most exciting and motivating of them all. Also, if you're thinking of teaching classes, I would suggest taking classes from other quilters (especially if you've never taught anything before - but this is a beneficial exercise for all teachers). You'll want to take note of their speaking style, their handouts, their organization, their demeanor, their individualized attention - and then decide what kind of teacher you want to be. I'm curious: what was the best quilting or sewing class you ever took, and why? Was it the class setup, the instructor's style, or what you walked away with? 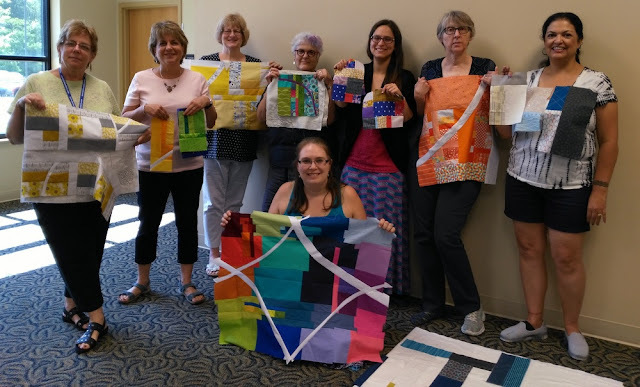 My favorite quilt class was with Jacquie Gering (I wrote about it here) because of how much attention she gave us individually, her memorable encouragement, and her thorough and clear organization. I love this! I want to start teaching workshops and eventually quit my day job -- you know, #thequiltersdream. 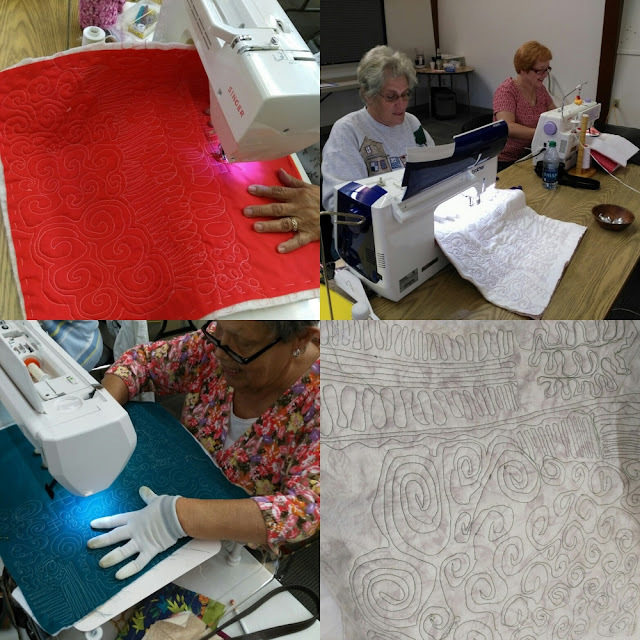 The best class I was ever in... well, taking free motion quilting on a domestic machine with Elizabeth Hartman was eye opening and life changing for me. And Cheryl Arkison's improv class at SewDown Portland was pretty darn spectacular. I agree so much that it is all about what the students get from the class and after teaching a full class of 8 at my LQS about FMQing in September I can't fathom having 20 in class! Wow! I really enjoyed Phillipa Naylor's applique technique class last month - I gained skills and took note of her teaching techniques too. I've taught a couple of classes at a local quilt shop this year - just three pupils in each was enough for me! I agree with you about the preparation before hand - it takes ages but needs to be done thoroughly. I've been teaching for almost three years and I know I have a lot to learn! Loved reading tour insights. This was a good read for me. I plan to offer weekend workshops from my home for up to 8 students someday. I've done a lot of teaching online, but expect it to be so different to teaching in person (and more fulfilling in certain ways).